New to our course programme for 2019, we're introducing a series of one-day and half-day workshops on various Saturdays throughout the year. Workshops will be held in our upstairs Studio 2 and will provide an introduction to a range of handbuilding techniques. They are suitable for beginners aged 12 and over. Gift vouchers are available for all workshops: give us a call to arrange! In this half-day workshop we will be using coiling techniques to create a medium-sized ceramic jug (suitable for use as a drinks pitcher or flower vase). A range of jug shapes will be available to choose from, and you will also learn to add a handle and apply various decoration techniques your completed jug. After the workshop, we will fire and glaze your jug ready for collection approximately 3 weeks later. 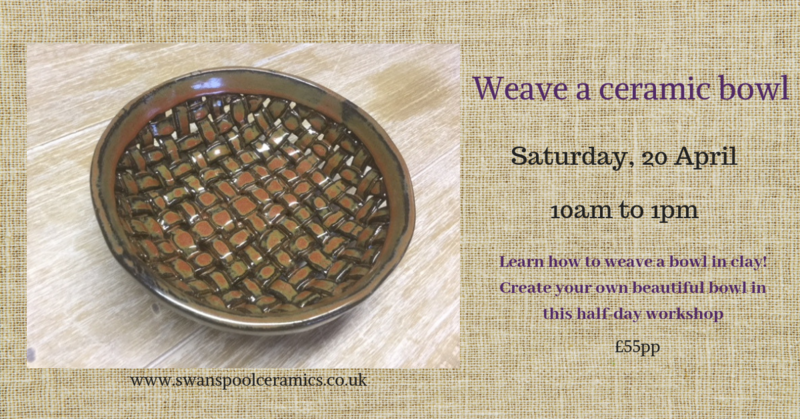 Join us for a relaxing and creative day making your own ceramic woven bowl. We will be using coiling & weaving techniques and a former to create one or more large or small bowls. You will also learn various techniques to add decorative touches to your completed bowl(s). After the workshop, we will fire and glaze your bowl(s) ready for collection approximately 3 weeks later. In this workshop, you will learn how to make your very own set of 4 tea/coffee/hot chocolate mugs. You will be using slab techniques to create your mugs, and will learn how to apply handles and various decoration techniques to your finished pieces. After the workshop, we will fire and glaze your mugs ready for collection approximately 3 weeks later.